Many beginning guitarists question how much to invest in their instrument when just starting to learn the acoustic guitar. 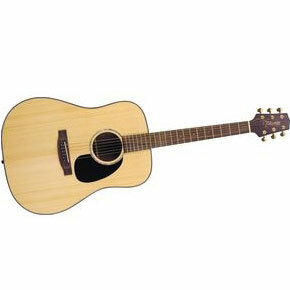 The Takamine G Series G340 eliminates the guesswork by providing a high-quality beginner’s guitar at a fraction of the price that most other guitars of this quality would cost. Made by the Takamine Company; a guitar company renowned for producing high-quality acoustic guitars at prices the general public can afford, the G340 has a rich, warm sound that will encourage the beginning student to keep practicing. And it doesn’t just sound good, it looks good too! The G340’s laminated spruce top combined with mahogany back and sides as well as a rosewood fretboard and bridge make for a guitar with classic good looks; looks which are enriched by the abalone rosette and inlaid abalone dots on the fretboard. While the spruce top is laminated and not a solid top, the low sticker price, combined with the overall quality of construction and richness of sound, goes a long way to compensate for this shortcoming. For an extra $50, the G340SC offers a solid spruce top model, which is worth the additional investment. And while the action may be a bit high for the professional musician, the beginning student will be rewarded by the big sound they can produce without over-taxing themselves. All in all, the G340 is a beautiful acoustic guitar that is the perfect learning guitar for the beginning student and will give them the quality and support they need to develop their guitar-playing skills. See more great guitar reviews at Takamine Guitars. Join in and write your own page! It's easy to do. How? Simply click here to return to Takamine Guitars.